May 2, 2018, 9:12 PM · Universal Orlando threw its grand opening party for Fast & Furious Supercharged tonight, bringing stars Vin Diesel, Jordana Brewster, Tyrese Gibson, and Ludacris on stage to christen Universal Studios Florida's newest ride. It's the latest instance of Universal creating a stand-alone attraction around an encounter from Universal Studios Hollywood's Studio Tour, something the Florida resort has been doing since it opened in 1990. (See Jaws, Earthquake, Kongfrontation, and then Kong v2.0.) In each case, Universal plusses the experience in order to give it the entertainment weight to stand alone, and Fast & Furious Supercharged is no exception. Here, fans walk through the garage where (Vin Diesel's) Domenic Toretto and his gang/family prep and maintain their street-racing cars before going through two pre-shows, in the family break room and (Ludacris') Tej's "war room," on their way to boarding the "party buses" that stand in for Hollywood's backlot trams. Fast & Furious is one of the top 10 highest-grossing franchises in film history, trailing Marvel, Star Wars, JK Rowling's Wizarding World, DC Comics, James Bond, and JRR Tolkien's Middle Earth. (And coming in ahead of Transformers, Pirates of the Caribbean, and The Hunger Games, though Jurassic Park will be reclaiming its spot in the Top 10 this summer.) But none of those franchises has so consistently given leading roles to people of color. Yes, the Fast & Furious franchise stands for fast cars and set pieces with incomprehensible stunt driving. But a lot of movies have served that formula over the years and hadn't enjoyed the same financial success. Fast & Furious resonates because it also tells stories that some audiences weren't hearing from major studio productions — at least, not about them. Strip away the cars, and Fast & Furious is a redemption story about society's cast-offs who come together to find success as an unconventional family. For a lot of Americans who until recently haven't seen a lot of people who look like them up on the big screen, that resonates. And, oh yeah, car chases are cool, too. With a huge queue and multiple pre-shows to work with, Universal smartly played up the family theme here, in a way that it could not in Hollywood, where Fast & Furious Supercharged closes the Studio Tour. The first pre-show in Orlando, in the "family" break room of the garage, allows Jordana Brewster's Mia Toretto to deliver to visitors an on-screen speech about the importance of family in the Fast franchise, inviting visitors to look at the photos of the various franchise characters in the room, including the late Paul Walker's Brian O'Conner — Mia's boyfriend, Domenic's one-time adversary and later best friend, and ultimately, the father of Mia's child. But while Fast & Furious addresses family and relationships, it never lets thinking about them stand in the way of big set piece. And so, here, we must move on to the waiting chase. Conflict drives stories such as these, and Universal has subtlety changed the precipitating conflict from the Hollywood version. There, Domenic Toretto remained the outcast "bad guy" from the early Fast films — wanted by the FBI and sighted on the Universal backlot. Here, the FBI is coming to raid the garage, but for what reason the ride never exactly makes clear. Conflicts in the Fast universe have more layers than Shrek's onion. Yes, the FBI is after the family. But the family also serves another government agency, the Department of State's Diplomatic Security Service. And the DSS is protecting a "high value" witness... who just so happens to be on our party bus. And, oh yeah, arch-nemesis Owen Shaw is after that witness and following the FBI to our location. Which all sets up the chase. Projected on screens on either side of the ride vehicle, Fast & Furious Supercharged, like its sibling Skull Island: Reign of Kong, throws more visual detail than you possibly could take in with just one ride through the attraction. Universal uses fog and wind effects to help simulate the rush of driving more than 100 mph on the bus, which is towed by a couple of Turbo Trucks on the screens. Guns blare, cars flip, missile-armed drones fly in, and the effect of G-forces on the human body takes some time off to enjoy the spectacle with the rest of us. Sure, it's cheesy and it's even harder to see from seats in the middle of the bus. (The best seats are on the far right side, given to the first person assigned to each row at the load platform.) But anyone wishing that Universal had taken a practical approach to Fast & Furious ought to be careful what they wish for. 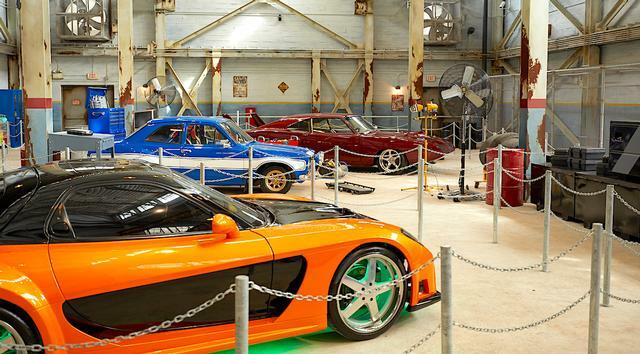 Remember, Supercharged is the second Fast & Furious encounter on the Hollywood Studio Tour, following a practical set inspired by the second third Fast & Furious movie, Tokyo Drift. For that, Universal mounted two street race cars on robots arms to simulate drifting. The "dancing cars" weren't the least bit convincing as racers, and the sooner we all forget that encounter ever happened, the better we all shall be for it. What about "real" stunt cars, you say? Disney just closed that attraction at Disney's Hollywood Studios. Universal isn't about to invest one of its top franchises in a concept that its biggest rival couldn't make work anymore. No, Fast & Furious needs its stars as well as its cars, and that means a screen-based attraction. Universal Creative announced tonight that Fast & Furious Supercharged will open with Universal Studios Beijing, too, so it's clearly happy with this concept. And I am, too. Yes, I wish that Universal had put us on a roofless party bus, so we all could enjoy a better view of the action surrounding us. But Supercharged otherwise delivers the wild fun of a Fast & Furious movie... not to mention the chance to ogle some sweet machines at the start of the attraction. No, this isn't Universal's best work. But it's good work, and it provides a much-needed theme park home in Orlando to franchise that most certainly deserves that. Tiny correction: Fast & Furious: Tokyo Drift is actually the third movie in the franchise (I regret to say it was played way too many times during my college years). If this is any way as good as the simulation performed in the Kong/Skull Island 'bus tour' then I'm pretty excited to ride it soon. I'm still blown away by how smooth that Skull Island's simulation was. I love the trend of ditching 3D for Ultra High Def 2D. Forbidden Journey is so much more enjoyable in 2D and I'd wager that many other Universal rides are too. You really only need 3D when there is substantial depth to the action on the screen. I would also contend that the larger the screen (Soarin, Kong, Transformers) the less believable and distorted the 3D becomes. I think Star Tours is the best example of 3D use being in space where the depth is really necessary, and the small field of vision allows for a clear 3D experience. Sorry but I also have to call out Universal on the totally mind boggling decision to put this attraction, which clearly takes place in downtown LA, in San Francisco when they have a Hollywood section of the park too! What!? I didn't know San Francisco had so many palm trees lol. I prefer Kong, but mostly because that one plays better for riders on both sides, and the Skull Island setting lends itself to suspension of disbelief better than San Francisco (or LA, for the Hollywood version). But I do like the move away from 3D on F&FS. I did enjoy Kong more than I expected, but F & F is not enough to lure us to Universal on our next trip, since we're in cost cutting mode (and this new attraction is not much different from lots of rides at Universal). I probably won't be visiting Universal Orlando again until after the new Potter coaster opens. Nicely done RN. Another E-Ticket opens in Orlando. Local media covered all of the grand opening festivities and gave a fairshare of credit for UO maintaining its groundbreaking virtual queue. It makes me wonder what's next for Universal Orlando? Anyone heard anything? Anything at all? 2018 - Fast & Furious (USF), Toy Story (DHS) / 2019 - Galaxy's Edge (DHS), NBA Experience (DSTP), New Cirque show (DSTP) / 2020 - Sky Liner (WDW) Ratatouille (EPCOT), TRON Coaster (MKP) / 2021 - WDW 50th Anniversary. Is this an advertisment or a journalist write up? Next up at UOR: 2018 - Aventura Hotel, New lagoon nighttime spectacular / 2019 - Harry Potter coaster, Endless Summer Resort Surfside / 2020 - Endless Summer Resort Dockside / No date yet - T2:3D replacement show. And then there's the Lockheed land project. Don't forget Supercharged also replaced Beetlejuice's Graveyard Revue as well! I am a little disappointed that they got rid of a practical effect ride and put in another screen attraction. I can't get past the overly stilted dialogue on the attraction (I've only viewed through the POVs FWIW). I know the series has always looked at the acting performances a little tongue in cheek, but good grief, Vin Diesel couldn't convince a 2-year old that he wasn't reading off a cue card - talk about a "phoned in" performance. I agree with Robert's assessment that trying to make this a practical effect attraction with a rather small footprint would have been a mistake, but I think this franchise deserves a much better theme park representation then what has been given here and in Hollywood. Cedar Fair's (former Paramount Park's) Italian Job/Stunt Coaster is far better at evoking speed and the thrills of a movie car chase, at least when those additional effects are actually running and timed properly. It really seems like UC was put behind the 8-ball in terms of developing this attraction, and it definitely shows. I see Universal's ambition to want to add a new attraction every single year, but with that desire comes some level of risk. We'll see how long this attraction lasts, but from what I've seen, it may not be much longer than the predecessors inhabiting this space. I do look forward to experiencing this in a little more than a month, but only about as much as I was for Fallon, which couldn't even meet my meager expectations. Another awful tram conversion. You have to twist your neck to see the show on both sides, which is made even worse if you sit in the middle of a 6 abreast seat bench. They didn't increase the length of the chase scene. They didn't import the scan of a passenger as the informant. A bit loss in the translation. I rode it during the soft-opening. In my opinion, the pre-show is way too long and boring. Disaster was cheesy but at least it made you laugh. The ride is short and not exciting enough. I have no issues with more screen attractions, I love that some attractions are more "accessible" to all ages, body shapes and abilities but I didn't care for this one at all. I guess if you are big fan of the movies it may be more exciting though. My family and I thought is was fun and a nice filler ride for the park. I think the new nighttime show is going to be their 2018 biggest hit. Just got off and everyone was talking about how lame, short, and confusing it was. Really boring ride honestly. People who have seen both coast versions say the 3D actually helped lessen how bad the effects were. We're one step away from a theme park just hoarding its guests into small white rooms with television sets airing non-stop advertisements and telling them it's a ride. Judging solely from reviews and POV videos, this looks like the weakest thing to come out of Universal Orlando in some time. While Kong was largely an import from the Studio Tour, it had more added to it in Florida and was a decent dark ride. Fallon, while not the greatest attraction, was unique and appeals to fans of the show. This, however, seems to add nothing of noteworthy value to the Studio Tour segment in California, and at a park full of simulators and screens the experience isn't anything new for park guests either. Sure, it's a good way to quickly get a popular IP into the park, but when almost every other major attraction on the property is superior, I wonder if that's enough for this to maintain popularity beyond opening summer. Nice ride. I like the way Universal is getting back to the "Ride the movies" theme. Did not care for the cheesy "party" pre ride movie, but then again I don't like the movies either. Thought it stood up well to non movie fans as an entertaining ride. Kong is better, as is Spiderman, Transformers and the Potter rides, but will definitely take people on it. Man, TH tries hard to troll and Robert just shuts him down. Sorry your "Universal has nothing in the works" rhetoric isn't going to get you anywhere Mr. Creative. As for this attraction...I have to ageee with AJ. This looks weak. I was very disappointed in Race Through New York and this appears to be another lackluster attraction with a virtual queue. Next up at DHS is Mickey's Runaway Railway in 2019? I can imagine at least 6 months before Galaxy's Edge, which will open in late 2019. The DHS attraction opening schedule is a bit murky beyond June 30's TSL debut. I had always expected that Galaxy's Edge would open about 3 months after Disneyland's version of the land. Topping off ceremonies were about 3 months apart last fall/winter, meaning that the two projects have remained about on the same pace. The conventional wisdom has been that Disneyland's would open early summer 2019 (May/June) with DHS's version opening late summer (August/September). Personally, I've been tentatively planning our 2019 trips with that schedule in mind with a trip to SoCal in August 2019 and to Orlando in October 2019 to avoid the crush of the first 2 months and to allow for some variability in the opening schedules. Disney threw a strange monkey wrench into the system when they announced MRR would also open in 2019. Obviously, they wouldn't want to open it too close to Galaxy's Edge, where it would buried in excitement for Star Wars, but they would also want to take advantage of peak crowds. As such, I had always assumed that Disney was targeting a March/April debut for MRR, which covers most, if not all of the Spring Breakers. Disney has been pretty quiet, understandably so with Pixar Pier and TSL debuts just around the corner, but I would expect the timing to be a bit more clear in July/August. There's also the Guardians attraction at EPCOT, which seemed like it might be working towards a 2019 opening, but seeing as they just finished pouring the foundation for the gigantic ride building, it might not be ready until 2020, same for Ratatouille. Ratatouille's structural steel is up. F&F is getting hammered in on-line reviews. I really liked Twister and was sad to see it go. I liked Earthquake and did not like Disaster, so I will be interested to see this, but I honestly have never seen a F&F movie, and I am an action movie nut. Universal does have several things that need to go, in my opinion. The Atlantis show is a waste of space, and maybe could be used for some better real estate. They have to keep ET, but, man, does it need to be redone. Universal's greatest weakness is real estate, but with Disney's ride management being what it is, my family simply has so much more fun at Universal even with its issues. Maybe Universal Studios new tagline should be "Ride the Screens..... we don't have a lot else for you!" I actually like the screens, and don't fully understand the hate. Spider-Man and Forbidden Journey are two of the best attractions all all time and rely on screens extensively. Unfortunately, due to the lack of real estate, Universal has to utilize screen to a large degree. I suppose a large group of people get motion sickness from them, and the can't exactly go ride the Hulk. Disney is embracing the screens as well, but I wish they all would bring the projection technology to the next level, a la the Pirates from Shanghai, I believe. The best experience for me is a combination of practical, screen, and fast motion, but I do recall seeing an amount of vomit on one of the oval screens inside Hogwarts the last time I was flying around on my enchanted cabinet. This is a great ride that fits somewhere between Jimmy Fallon and Reign of Kong IMHO. It continues the trend of drawing you deeper into immersion as you progress through various well-embellished queues and pre-shows. TBH, a lot of the reviews that are saying it is disorganized, nonsensical, and cheesy have obviously not watched he movies, which are also disorganized, nonsensical, and cheesy. Also, for the screen haters, there is a lot of physicality to this as well, with the initial tunnel scene and the physical outdoor sets before the immersion tunnel. Kong wins over FF for its more immersive outside views (with the huge gates and mountains), an even more immersive queue that is higher-tech, a more viewable landscape in the 3D screen scenes, and groundbreaking Kong and old-lady animatronic. So, is FF the next Escape From Gringotts? No, and it isn't supposed to be. It's a fun romp through a ridiculous franchise that was designed and intended to be more than Fallon and less than Gringotts. In that sense, it is perfect. To add to DB Cooper's point, this is a screen ride based on a iffy franchise with a similar ride system to one in it's sister park. In other words, it's not built for us and the online park fan community. Robert has already written how the demographic of this franchise's fanbase and the online park fans don't overlap. Add in the fact that the general public clearly prefers screens more relative to us, with screen rides leading to massive attendance growth at universal and now popping up in Disney while most of us online complain about any and every screen. Then we get upset about things like transformers using Spider-Man's ride system, but the average visitor doesn't even care or notice. I imagine the same would happen with Kong/F&F. In short, this ride was practically designed to fail with online park reviewers. How it fares with the general visitor is still very much in question. Sorry got to disagree with this review. I rode the ride a few times to give it the benefit of the doubt but it’s really poor. Kong is better next door using the same ride system. The queue (prior to the lame pre-show rooms) is the best part of the attraction. Potentially relevant archive link: Does Universal Studios have too many screen-based rides? I just got home from visiting the park. As an AP, I constantly find myself asking why I renewed my pass this year. The screens bore me nowadays, and its overkill. Kong was alright, but this new F&FS is ATROCIOUS! The action looks so... fake. The jump at the end?? Ugh. Also, I'm tall. Like, really tall. There is no leg room on these tiny narrow rows. I was wedged in my seat, knees at my chest, feet off the floor. I remember when Kong opened, so many people complaint how tight the rows were, cramming 6 people per row. I can't believe they are doing the same thing on this one. So happy I only had to wait 7 minutes, in the strand-by line.